We partnered with Ashley Streicher to create a backyard that’s fit for outdoor entertaining. 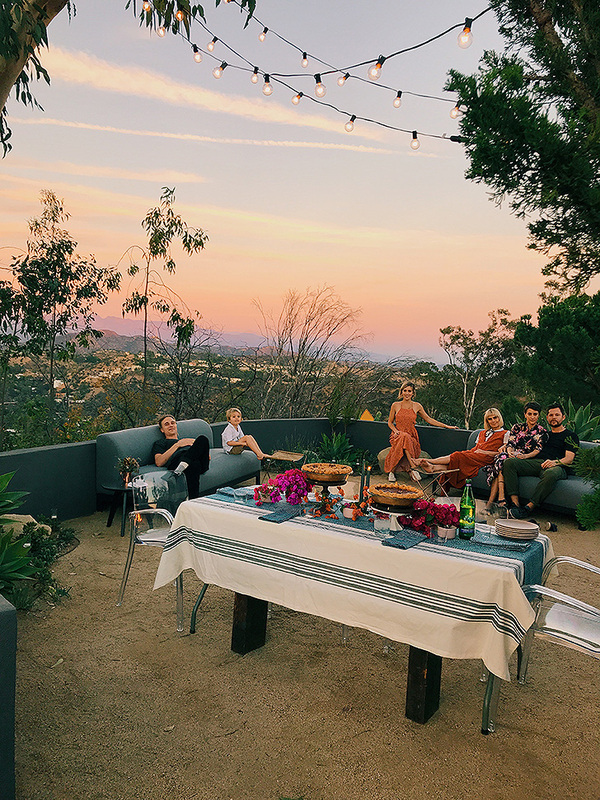 Read on to see the space (and swoon over the view) and learn more about Ashley, one of three sisters behind STRIIKE beauty studio in Beverly Hills. Also check out her sister Jenn’s modern and feminine bedroom reveal. To me it means working with what you have been given naturally and making it your best! Feeling confident and comfortable in your skin looks beautiful to me. I would love to do a line of products and tools. I also like the idea of doing a line of things just left of center for us, like makeup organization tools or something with interiors. The three of us are great at creating a vibe and feeling (like at STRIIIKE), so I’d love to play off that. Getting outside the city and being in nature, whether it be the forest, desert or ocean. I’m always inspired by museums and all other bodies of art. I love going to different art museums in all the cities I travel to. I’m inspired by fashion, I think hair and fashion go hand and hand, so always keeping up on the newest collections and looks. I’m always inspired by the European girl or the French girl. The girl who does a lot, works, goes to parties and also is a homebody. She’s always looking put together yet edgy and a little undone, not fussy. I’m inspired by Lou Doillon, she encapsulates that girl. It’s been a three-year lesson in how to find that. I think the first couple years STRIIIKE was open there was no balance at all, it was all focused on work. I think JUST recently I have been able to find my voice (being the little sister) to speak up about what I need and how I want my schedule to be. The three of us found it super helpful to go to “sister therapy” when we started to maintain communication and balance as family. At the beginning we were spending SO MUCH TIME together, and now we have each taken on our own roll in the business that keeps us a little more independent. I like things to be clean but also interesting. I think it’s REALLY important to make your home something your inspired to live in and to make it also your comfort zone. It should be a place to relax your mind and get re-inspired at the same time. What are three products you can’t live without? There are MANY things I find fulfilling about my work which makes me feel very lucky. But probably the most fulfilling is the process of getting close enough with someone that they trust me to find their best version of the way they feel most comfortable and confident. I like my relationships with my clients, it’s definitely my social outlet. I’m otherwise a pretty introverted person. Challenges are meeting somebody for the first time and trying very quickly to get their vibe enough to cut or style their hair. It’s a very intimate trusting process, so you have to be trusting and open yourself very quickly. Sometimes it takes a while for people to open up enough to you for you to figure out what they’re about. The more I know someone I find the easier it is to give them what they want. Being able to be outdoors 90% of the time. It allows me to be as active as I want and to always feel full of energy. I also love how much access we have to amazing produce and foods and great restaurants. There’s ALWAYS something to do in this town!